As you have heard us say more than a few times in recent months, honeybees are in the fight of their lives right now. They will take any help they can get, especially when it comes to pesticides that are harming the honeybee population. Quebec is the latest to jump in to help the pollinator, as it is taking measures to regulate pesticides believed to be harmful to the honeybee. Along with both Montreal and Ontario, both of which have put restrictions or bans on pesticides, Quebec will now require farmers to have permission from a certified agronomist before they are allowed to use specific pesticides on their crops. By making this move, the sustainable development minister hopes to take the concerns of the farmer into consideration as well as helping to preserve the local honeybee population. As expected, some of the farmers are protesting the move as it can add to their production costs, but they also need to realize how important the honeybees are to their crops every year. Luckily, and as we mentioned in a post earlier in the week, there are some major research projects underway to make use of chemicals that have been on the shelves for years simply due to the high cost of testing with them. With the new funding, scientists may be able to come up with more affordable solutions for farmers that will also help preserve the local honeybee populations. Regardless, though, farmers may have to simply accept the fact that the price of business is going to go up if we are going to keep these honeybees healthy. And, consumers are going to need to understand that the cost of some of their favorite crops are going to go up slightly as a result. The alternative, though, could be no crops at all, and I doubt anyone wants that. 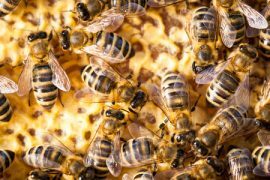 With other counties being so aggressive in their efforts to help the honeybee, it will be interesting to see if the United States follows suit. While they are some very good programs in the works, we need better restrictions or the colony collapse problem will continue to grow.